Somalia is a land that has descended so deeply into misery that "failed state" is now too generous a description for the country. Yet it was hard not to marvel at local politicians, appointed by outside forces, wielding almost no power at all but still able to find ways to make things worse. Case in point: on Sunday, President Abdullahi Yusuf Ahmed announced that he had fired the Prime Minister, and 24 hours later, parliament rebuffed him. The standoff has further hardened the political paralysis that has denied any prospect of peace to the country's long-suffering people. 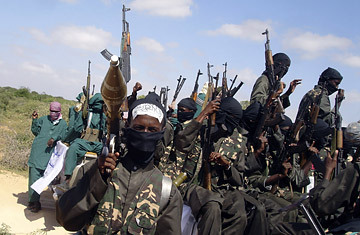 In recent days, al-Shabaab have all but surrounded Mogadishu and appear poised to launch a new offensive at any time. The transitional government of President Yusuf, set up and backed by Ethiopian troops, has been confined to the town of Baidoa and a tiny wedge of Mogadishu. And the transitional administration seems dead set on emphasizing its transitoriness with infighting. Yusuf's firing of Hussein was dubious at best because the government's charter states that the President needs parliament's approval for such a move. Indeed, the parliament returned to back Hussein by a vote of 143-20. A spokesman for Yusuf quickly called the vote unconstitutional. In a country whose people are renowned conspiracy theorists, the rumors were already circulating that Yusuf, a former warlord and a political tactician par excellence, feared the possibility that the Prime Minister's deal would lead to elections that would remove him from power. Never mind that Yusuf himself was supposed to organize those elections when he was appointed in 2004. "We Somalis all know that Yusuf is against any peace agreement," Mohamed Aden, a regional administrator in Somalia, told TIME. "If it comes to elections, Yusuf will lose because he is so unpopular." This kind of scrapping is old hat for Yusuf, a former Somali army officer who later became one of the country's most powerful warlords. He had forced the previous Prime Minister, Ali Mohamed Gedi, to resign after a political struggle. Yusuf has enormous power because he comes from one of Somalia's biggest clans, the Darod, and carries the implicit threat of a new outbreak of clan fighting wherever he goes. He and Hussein had been fighting each other for months. In October, leaders of the East African regional group known as the Intergovernmental Authority on Development, or IGAD, scolded Yusuf and Hussein for infighting. Their dispute grew even more bitter after Hussein fired the mayor of Mogadishu and the pair could not agree on new Cabinet appointments. Ethiopian Prime Minister Meles Zenawi, who ordered his troops into Somalia two years ago to prop up the transitional government, called the squabbling a "never-ending saga" that must end. The Council of the European Union declared the same, saying it was time for the transitional government's leaders "to end these conflicts and to concentrate on the real challenges faced by the Somali people, notably peace, stability and reconciliation." The perpetual struggle in Somalia has demoralized its people so much that lawmakers made no secret of their embarrassment about the parliament they belong to. "There is no transitional or any other government in Somalia," lawmaker Ahmed Omer told TIME. "Parliamentarians can go to bed at night with one idea and wake up in the morning with another. It's a frustrating government."